Alan Shearer – if not now, when? If not he, then who? | NUFC Blog. Alan Shearer – if not now, when? If not he, then who? Waiting for another bite at the cherry? It’s a debate that’s raged for months but I thought I’d raise it again simply because the end may be nigh, one way or another. 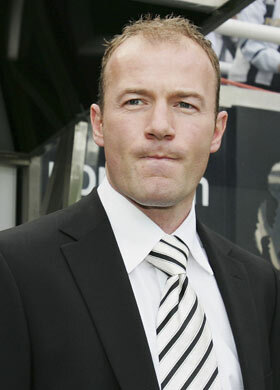 Who wants Alan Shearer at the helm? All in favour, say wheyaye. OK, a little more serious then, why is there even a debate? I’m reasonably certain an overwhelming majority would have been either fully in favour or at least apathetic to his permanent appointment before his brief and ill-fated sojourn into the managerial hot-seat. So partly the reason more supporters are against the idea is due to the fact that Big Al fairly spectacularly failed to save us from the drop. What portion of blame you attribute to him is also very debatable, though to my mind he’s pretty blameless. However, there’s no getting away from the facts, he failed to do what many hoped and secretly believed he might do. That was to re-unite the dressing room and galvanise this stricken club. Alas, despite his monumental presence on the field during his playing career, Shearer wasn’t able to transfer his influence on the dressing room sufficiently to prevent the inevitable slide. Supporters on the flip side of the coin will take umbrage at that view and will point to the very word ‘inevitable’. They would argue that nothing and nobody could have prevented our demise once we hit the final straight and that our place in The Championship was booked long before Big Al was given the opportunity to try and turn it all around. So are these people blinded by regionalist bias and a weird penchant for the messianic? Is he really only the right man for the job because he’s ‘one of us’? No, but it’s still quite simple. His locality and his roots with the club might serve him well but what Shearer has going for him, so far as I can see, is that his personality, his character and pedigree within football, on paper at least, suggest he could make a good manager. Ambitious, strong, charismatic, thoughtful and deliberate in the way he presents himself with a professionalism and class that this club is crying out for. Success would not necessarily be guaranteed of course and there have been plenty of former greats who fell flat on their managerial faces. But if he doesn’t give it a go on a longer term basis, we’ll never know either way. I’ve also heard the argument too many times now that Alan Shearer is required to go away and earn the right to be our manager at a lower level, and I quote numerous universal sources, “like a Championship club”. Has it not sunk in yet? And does this argument not fly in the face of our defence against the nation’s criticism that we’re arrogant and deluded? Since when did we become too big and important for managers to cut their teeth at our club? Particularly, but not wholly, when the one in question has already earned our trust and respect on the field. Isn’t he at least halfway up the ladder? And when exactly would we be happy with his CV? What if he proves to be one of the greats and we miss out on the opportunity of using that to our advantage when we are where we are? We could damn sure do with the help. They then completely ignored both Shearer and their previous statements to leave the club in limbo. Therefore, it seems unlikely if not out of the question, that Ashley would bring Shearer back in permanently. That is undoubtedly because Shearer is prepared to stand up to Ashley and demand the kind of decision-making and investment we’re clearly desperate for. However, despite that snub, he remains a very good option and for this particular supporter I can’t realistically think of a better available option right now. That decision is out of my hands and the rest of the patient thousands willing this new chapter of our’s to begin. But if Big Al is leading the way in the near future, this is one person who will be quite happy with that decision. Because I ask again, if not now, when? And if not he, then who? It didnt work out second time around for Keegan and it didnt work 1st time around for Shearer but still there are many fans who somehow believe that former great Newcastle United players are guaranteed to be great managers simply because they “know” the club, the fans and the City. I “know” the Club, fans and the City but nobody asked me to take over the reigns. Let Hughton carry on while the squad are doing the business on the pitch and save the club at least £3m a year on wages. well,.. gary lineker said it and shearer agreed with him (MOTD) last season. We are in this mess because Ashley ,Owen ,Llambias,Duff and some others didn’t give a s**t about the Toon as long as they could get the cash they signed for. A true pro would of give up the big cash to return the Toon to the premier league but our dross left because they couldn’t milk the club for any more cash. If Ashley was a man he would walk now after saying sorry at least 52,000 times for doing this to such a fine club. The two reasons why Shearer will not be here soon can be found in the video here, check it out. Good post BBM, igniting a hotly contended topic. I have mixed views on Shearer as manager but I certainly don’t think he can be judged by his 8 games at the end of last season. Fans that are prepared to judge him on that are part of the problem at NUFC in my opinion, living up to the stereotype of impatience and an expectation of instant results. That doesn’t just apply to Shearer though. I don’t think we’ve given any manager enough time to be judged since SBR. In fact, since we’ve been in the PL, only Keegan (1st time), Dalglish (just) and SBR have been given enough time to make a difference. Essentially we haven’t a clue what sort of manager Shearer would be. Instinctively I think he’d be okay but that’s just guesswork. Had we remained in the PL I would have been less keen on Shearer as manager but, as you say in your article BBM, we’re now a lower league club and I think if Shearer’s going to be given a crack then now is as good a time as any. Yet I’d still be nervous. Not so much at his lack of experience but at the fact that it would continue to fulfil Geordie Messiah prophecies, which I don’t think is healthy for the club. I wouldn’t let that fact alone be decisive, but it would make me nervous. I think there are better options than Shearer in pure management terms. I always liked the idea of Curbishley and of course there’s a whole world of dream managers that simply wouldn’t come here. I don’t think Hughton can be judged yet either, although we can’t argue with the start he’s made. My main concern is that whoever we appoint is appointed long-term: 3-5 years. I’d be quite happy to see Hughton given a go providing it’s on a long-term basis, but I’m not so keen on the idea of him just fulfilling a ‘stop gap’ role. I think we need long-term planning starting from now and projecting 5 years at least. Of course that won’t happen while Ashley’s still there, which is why he must go. If Hughton is one of the reasons we got relegated, then Shearer is one of the reasons too. You can’t judge him by a different yardstick to everyone else, that would be unfair, illogical and counterproductive for the club surely? Your assessment of Shearer’s qualities are spot on – sadly over 8 games (nearly a quarter of the season) he failed to instill these qualities in the team. His rejects – only 3 of the chosen ones remain – are doing ok in the ccl. Aye and I’ll say again he needds experience in the lower leagues not warming his arese on the BBC. You cant think of any managers you’d prefer – you’re kidding right? Read the above comments and add in egg nog late of Zenit St Petersburg. Fro – if that was directed at me then you’ve got me wrong. I said I can’t think of a better available option out there. Of course there are proven managers with great CVs but how many could we attract? Well the spectre of Shearer will be hanging over any future manager, so IMHO he may as well be given the chance now. If he is a success (does that mean promotion?) then fair do’s, if not at least the club can move on. Surely it makes more sense to bring him in now, so he has the time to mould the team HIS way, than to wait until we do get back in the prem and bring him in on the back of someone elses success. I wish he wasn’t so demanding with his wages, especially now we are in the ccc. Also he must know the financial mess the club is in. Dont think its right to give Houghton the job, he’s no more experienced than Shearer, but he is turning out to be a bloody good coach/trainer. If Shearer does come in, then I just hope he keeps CH onboard. Also he doesn’t need that Dowie chap with him. Good article Bowburn. If not now, WHEN???? ?